Here is information about the newly released Waterloo Directory of English Newspapers and Periodicals, 1800 - 1900, Series 2 in 20 volumes. North Waterloo Academic Press, 2003. Here is a directory to the largest single body of historical documents arising out of nineteenth century England at the height of the British Empire. This empire was by some measures the most powerful and influential in the history of civilization: she held sway over the largest land mass and the greatest proportion of the world’s people. Having become in the 19th century one of the most literate of all societies, England established the Victorian periodical and newspaper press as a primary vehicle of participatory democracy. The Directory provides a more comprehensive, detailed and useful bibliographical record (including Locations and facsimile Title Pages) than we yet have for printed books, government publications or manuscripts of the century. It is subject-comprehensive, intending to include every periodical and newspaper published on a regular basis, from daily to annually, in every language, within England: a goldmine for cultural historians, genealogists and all subject specialists. Newspapers and periodicals were more than one-hundred-fold the volume and readership of printed books. The 20-volume set has a class A, gold-stamped red buckram binding. Series 2 includes all 25,000 of the Series 1 (1997) entries, most of them now updated, and an additional 25,000 entries, for a total of 50,000. It has 4,000 more facsimile title pages for a total of 9,000, and includes 48,000 personal names. For instance, every name in the DNB and Modern English Biography which is associated with a Victorian periodical appears here. Library locations are provided for the UK and North America. Indexes are provided by title, subject, place of publication (by town and county), issuing body and people. A major feature of the Directory is the development of a family tree for all titles related through mergers, common issuing bodies, or title changes. The online edition is updated daily. This series includes the pertinent holdings of the Cambridge University Libraries, the University of London Libraries, the British Library's three branches (the main Euston Road branch, the Colindale Newspaper Branch and Boston Spa Yorkshire Documents Lending Branch), and such specialized London repositories as the Royal Society Library, Wellcome Medical Library, and the Royal Institute of British Architects. All the nineteenth century English titles in NEWSPLAN are included, usually in much greater detail. The Directory also contains data from some 8,000 secondary sources which together provide scholarly commentary on the majority of entries. “Only through patient and painstaking labour were the great reference books produced that we now take for granted... Johnson’s English Dictionary, the original Dictionary of National Biography, and the Oxford English Dictionary. It appears that The Waterloo Directory of English Newspapers and Periodicals… will now take its place in this distinguished company. … These research aids make information readily available to even the most inexperienced investigator; for the specialist they are indispensable. … The method of publication adopted by North is unique in the history of scholarship and makes pioneering use of modern technology.... It opens the door to knowledge previously unobtainable in the life-time of one editor, or even a committee of editors, and offers a most illuminating example of the constructive and responsible application of the tools of modern society to scholarly research. [There are] thousands of instances where the material in The Waterloo Directory is indispensable in illuminating the past. 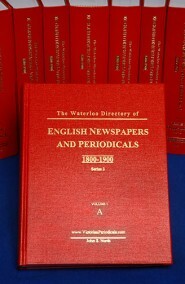 In 2001 the Waterloo Directory Series was nominated to the MLA list of best scholarly works of the twentieth century: “The great reference works that enabled scholars to conduct extensive research in the field of Victorian and Edwardian periodical literature are the product of the twentieth century from its midpoint onward. These include The Wellesley Index to Victorian Periodicals, 1824-1900, The Waterloo Directory of Victorian [and Irish and Scottish] Periodicals. “[These 20 volumes] have explored and revealed the vast scale and scope of Victorian periodicals publication…[by] seeking out, analyzing, describing, and recording heretofore unknown, unappreciated, and therefore unutilized primary source documents.... The spin-off impacts of this research and publication have major implications for the interpretation and further scholarly study of every aspect of that era.…an indispensable working tool and a scholarly legacy. Services, University of Alberta Library. Six indexes: Title, Place: Town, Place: County, Issuing Body, People, Subject. Each index may be either browsed alphabetically or searched for a specific word. Advanced search: by an combination of Title (partial or whole), Issuing Body, People, Subject, Place, Dates. A Search History is provided for each session so that scholars may record, return to or modify any request. Browse our online sample queries and notice our answers. The standard Licence may be tailored to the preferences and jurisdictional requirements of each customer. Series 2 renders Series 1 obsolete. However, customers who have purchased Series 1 in print or CD-ROM version are given credit for the full price of their Series 1 purchase against the Series 2 price. The 20-volume set has a Class A library binding, acid-free paper, and a gold-stamped red buckram binding. 8.5 x 11 inches. Shipping weight 120 pounds. See attached order form or order online.